While we don’t normally frequent Taco Bell for our taco fixes, there are certain times when even Taco Jesus is compelled to make a run for the border. This past Sunday was one of those times. We had plans to go out for breakfast, but then we saw a commercial advertising Taco Bell’s new Naked Chicken Chalupa which basically looks like a taco with a “shell” made out of fried chicken. We’ve been intrigued by this new item since we first saw the ads so we decided to take a road trip to our neighborhood Taco Bell and give this bad boy a try. We were not disappointed. The chicken “shell” was wrapped around the toppings of lettuce, tomato, and some sort of very tasty avocado ranch sauce, and this delight earns two thumbs up from Taco Jesus himself. Think outside the bun and get your fanny over to Taco Bell to pick up one of these taste delights, and tell them Taco Jesus sent you. 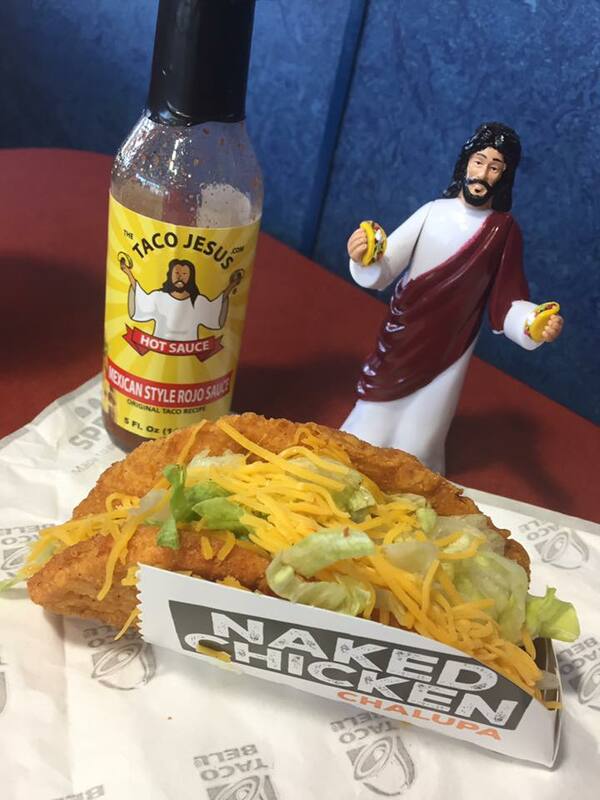 This entry was posted in Taco Reviews and tagged hot sauce, naked chicken chalupa, taco bell, taco jesus by Taco Jesus. Bookmark the permalink.